Each observation falls into one of just two categories, which we will call success and failure. There are a fixed number, n, of observations. The n observations are independent of each other. The probability of success, p, is the same for each observation. At Herky, Inc., a company with a large number of employees, approximately 25% of the workers are vegetarians. If a group of 12 Herky, Inc. employees is randomly chosen, what is the probability that the group contains exactly 5 vegetarians. Anne's displayed answer is 12C5(.25)5(.75)7 = 0.1032, or about 10%. 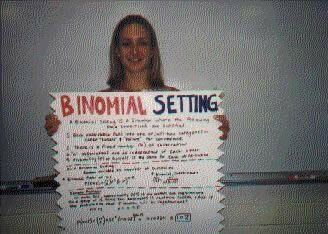 Note: Using the TI-83, one can calculate binompdf(12,.25,5) = .1032.